Saturday, April 29, 2017 was “FWATA Hall of Fame Day”. 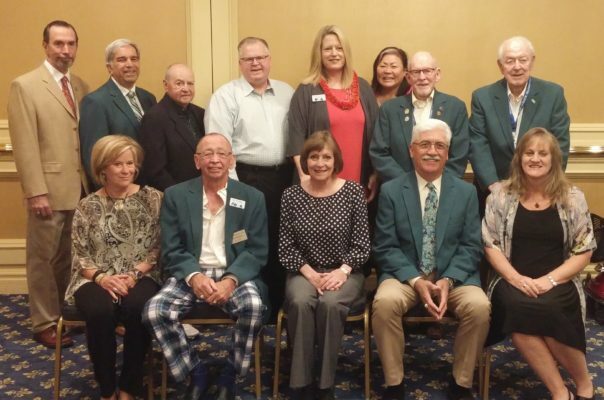 The day started with the Hall of Fame Breakfast where eleven HOF members joined to welcome Carolyn Peters to this prestigious group of FWATA members. 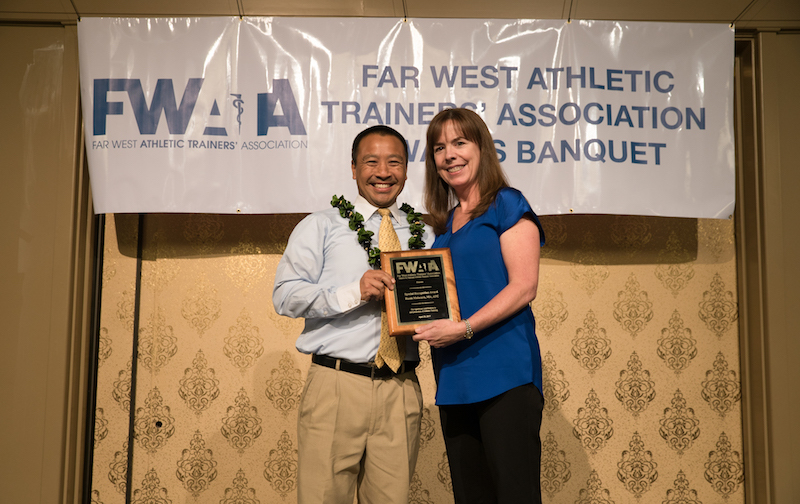 “FWATA Hall of Fame Day” concluded with the 2017 Awards Banquet. All the HOF members in attendance joined Carolyn Peters for a group photo in front of the FWATA Hall of Fame booth.During the banquet, the 530+ attendees enjoyed a delicious dinner while the 25 year members, 50+ year members, FWATA Student Scholarships and Research & Grants Awardees were recognized. 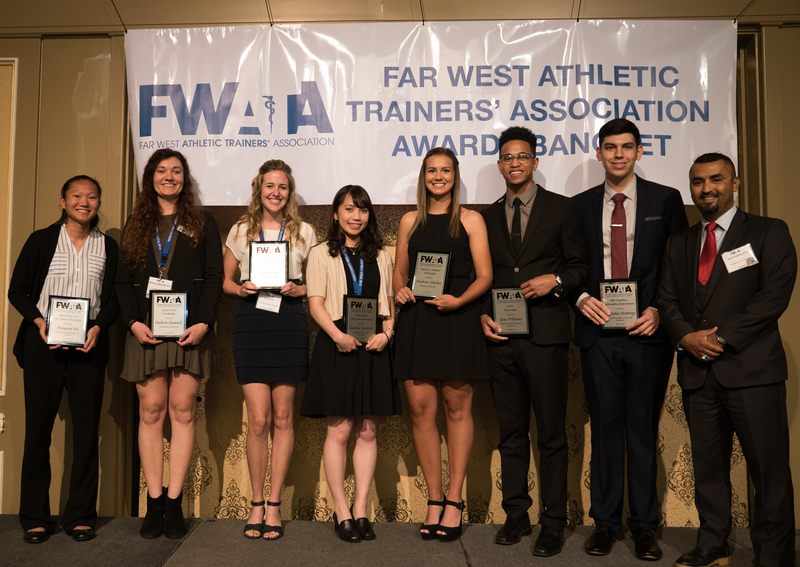 On behalf of the FWATA Scholarship Committee, we’d like to congratulate this year’s winners. These outstanding individuals were recognized during the Honors and Awards Banquet. 1st Place: Kipnis CM, Samuel MN, Tandy RD, Wiegand KR, Radzak KN. The acute effects of different foam rolling timing durations on hamstring flexibility. 2nd Place: Kasamatsu TM, Valovich McLeod TC, Register-Mihalik JK, Welch Bacon CE. Concussion education associated with Teachers’ increased familiarity with and recommendation of academic adjustments for adolescents post-concussion. 3rd Place: Sumida MM, Parke EA, Stickley CD, Oshiro RS. The effect of microclimates on assessing risk for thermal stress during athletic participation in Hawai’i. 1st Place: Arthur RJ, Brooks GR, Thompkins IT, Johnson TA, Friesen LM, MacDonald N. The effects of acute exercise-induced dehydration on the Sport Concussion Assessment Tool 3rd Edition. 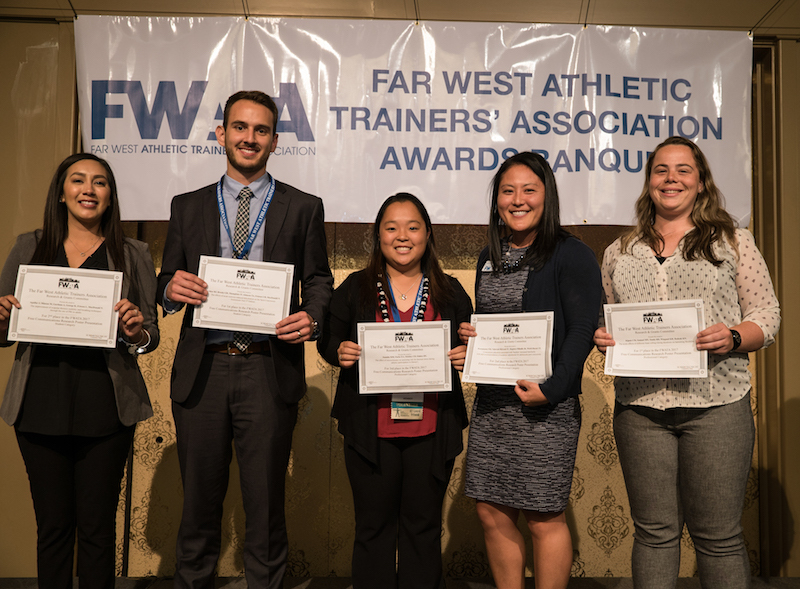 2nd Place: Aguilar J, Minson M, Garduno A, George K, Friesen L, MacDonald N. The improvement of scapular thoracic mobility and breathing techniques through the use of PRI in adults. The effects of pulsed dynamic compression on subjective and objective measures of recovery following intense exercise. Athletic trainer’s paper versus electronic documentation behaviors:implications for elevating patient care and professional recognition. 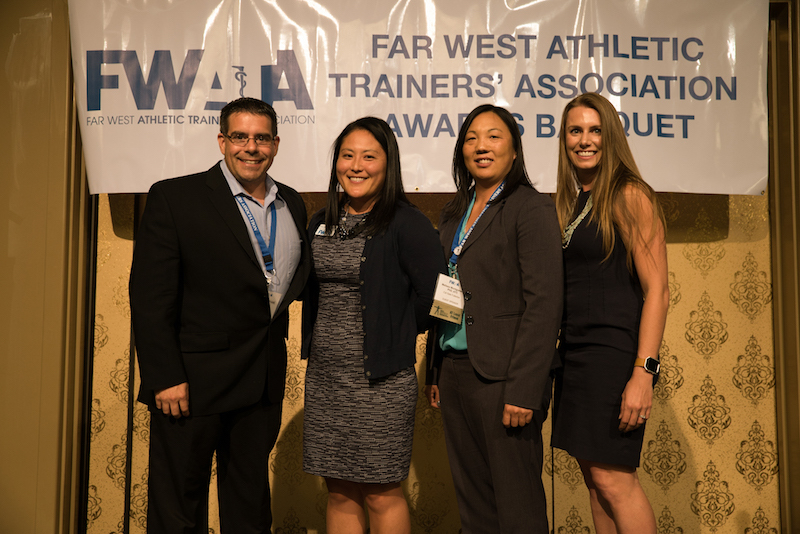 The FWATA Honors & Awards Special Recognition Awards were presented by Todd Hamburg to Ginger Lei Salera Ehrke and by Kris Boyle-Walker to Ruem Malasarn.